This eyewitness report was sent today by activists at the center of the labor demonstrations in Madison, Wis.
Today is the without a doubt the biggest day of demonstrations yet since workers and students took to the streets a week ago to protest Gov. 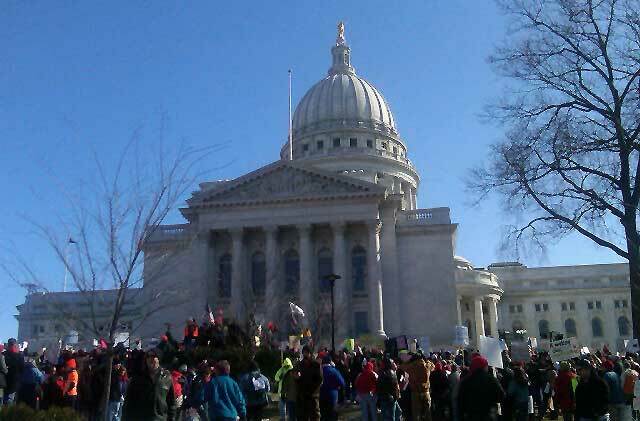 Scott Walker’s assault on the public sector’s collective bargaining rights. The streets were filled with chants of “Kill the Bill!” as tens of thousands of people flooded the streets of downtown Madison. Virtually every union from not only the public but also the private sector is present at the demonstration; among them the SEIU, AFSCME, UAW, IBEW, Teamsters, iron workers, plumbers, firefighters, various teachers unions and many more. High school and college students have come out in large numbers to support the workers’ struggle. The State Capitol has been completely taken over. Students have been occupying the building around the clock and workers have returned each day to press their demands. Security and police have been largely standing aside while workers and students direct protesters coming in and out of the building. All four floors of the rotunda are presently packed with demonstrators. Banners and signs supporting the workers are hanging throughout the building. A morning rally on the steps of the capitol was followed by a march around the building. A strong sentiment of solidarity has been forged between the community, students and workers from various unions. 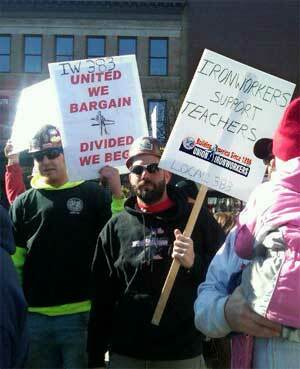 Placards with messages such as “United we bargain, divided we beg” and “Ironworkers support teachers” are seen everywhere. Handwritten signs in support of the workers covered the windows of restaurants, cafes and other small businesses around the capitol. A plane flew overhead with a banner stating, “We support working families.” Similar messages of solidarity were seen all around. The Tea Party, which had scheduled for today its first “big rally” in support of Walker and his legislative assault on labor, mustered only enough support for a minuscule demonstration that was completely dwarfed by the mass presence of labor and its supporters. The resilience and fighting spirit of the workers have been an inspiration to all who have come out, and given a real-life lesson on the power of organization. Spirits are high in Madison. The fight is not yet over.